The word ‘prehab’ may sound like something reserved only for athletes, but it’s actually something everyone should be doing – regardless of your training goals or fitness levels. To me, prehab incorporates stretching, foam rolling, trigger point work (such as lying on a cricket ball), physio and massage, all for the purpose of preventing injuries and the need for rehabilitation. I do however get lazy from time to time and I skimp on my prehab work. But a few days of this, I start to get tight hips and tight across my lower back. Nothing serious, but enough to get me out of my training groove and not get the most out of sessions. I have a congenital hip issue that sees my hips constantly sore. Skimping on my prehab means I make it worse. But it’s not just about preventing injury, prehab also helps people become more mobile and move more efficiently. A client of mine who was struggling to get to depth in her squats has recently added some banded hip stretches to the start of her sessions and instantly found she could get to depth! It’s not just about the hips though. The whole body needs to stay mobile and injury free. I try and spend 10-20 minutes a few times a week working on my mobility and doing trigger point release work. 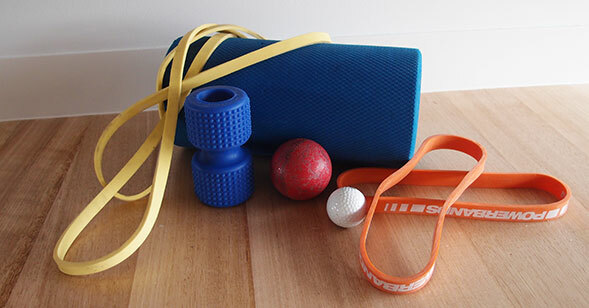 I do stretches, roll on my foam roller and as unpleasant as it is, lie on a cricket ball around the hips and use a golf ball for around the shoulders. Everyone will have different prehab needs and should emphasise the areas that they need to work on – feet, ankles, hips, back, chest, shoulders – practically anywhere on the body! Perform prehab two to six times a week for 10-20 minutes. You can do it at home after you wake up, before you go to bed or at the start of a workout. Your health and fitness is a priority and this includes mobility. You don’t have to do work on your whole body each time, but small amounts regularly is the key to success. Don’t wait until you are sore or injured to do it. See prehab as a maintenance system for your body. Regular maintenance will keep you mobile, less sore and hopefully injury free, which will not only result in a higher training performance but also in a greater sense of wellbeing.